This section contains Indian bare Acts and Rules in vogue. 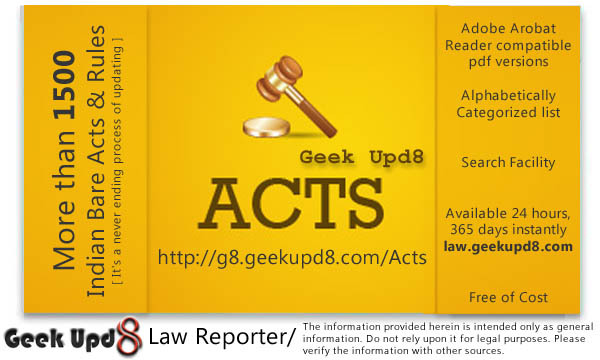 This section is under continuously updated since the foundation of Geek Upd8 - Law Reporter. Many acts and rules are not printed by publishers simply because it is not economically viable to publish them. But we'll keep adding more such Acts, Rules, Notifications etc. here, to keep you updated. Bare Acts Meaning :The ‘Bare Act’ is an expression used to specify the content of law, bereft of any interpretative gloss. In a legal library in India and many parts of the English-speaking world, a Bare Act is a document that simply codifies a law without annotation or commentary. The ‘Bare Act’ is legality pared down to its textual essence. It expresses only what the law does, and what it can do. Although every possible care has been taken, while online publishing the Acts and Rules, Geek Upd8, any author associated with this website or any of its employees is not responsible for any mistake or in accuracy that might have crept in or any loss or damage resulting out of such unintended mistakes. Readers are advised to verify and check the contents with the Official Gazettes or other means. 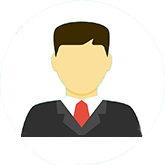 Any mistake reported will be highly appreciated and updated as soon as we come to know about it. Below you can find the list of bare acts for free download, you can read them online as and when yu wish. To download the bare acts pdf, all you have to do is click the pdf button to generate your free copy of the bare act. Thank you Sri.Puneet for the helpful information. My pleasure Sir. I hope everyone out there can use the resources that are available for everyone but only few are using them. Share and help our fellows. Thanks brother for your valuable information to our legal fraternity. Well done. Your Website now looks more useful.